Zouba Baaziz of the Spread Eagle says: "the dessert Penny is thinking of is our chocolat prélat (literally 'chocolate prelate') a rich chocolate mousse that we serve with brandy sauce." Line a 450g loaf tin (around 19cm x 6cm x 9cm) with clingfilm. Put the chocolate, cocoa, butter, espresso, Baileys and Kahlua in a bowl over a pan of simmering water and leave until the chocolate has melted. Stir until smooth and leave to cool slightly. Meanwhile, beat the egg whites until they form stiff peaks. In a separate bowl, beat the cream until firm peaks form. Gently fold the egg whites, then the cream, into the chocolate mixture. Pour into the terrine and chill overnight. Meanwhile, make the sauce. Put the sugar and water in a small pan. Heat gently until the sugar dissolves, then boil for about 20 minutes, until you have a golden caramel. Add the brandy (stand back, as it will splutter), then stir in the cream. Cook for 5 minutes, then finish, if you like, with the calvados. Leave to cool, then chill. To serve, carefully turn the prélat out of the tin (the texture is quite soft) and slice with a knife first dipped in hot water. 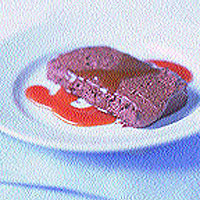 If you prefer, you can set the mousse in individual ramekins or dishes. Serve with a spoonful of brandy sauce.